Aristida tuberculosa.Bobby Hattaway.www.discoverlife.org (Accessed 5/2014). 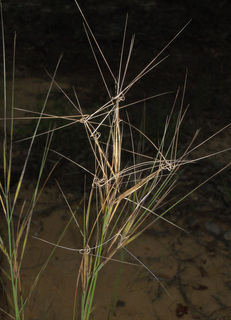 Aristida tuberculosa is an annual C4 grass (Voznesenskaya et al. 2004; Cerros-Tlatilpa and Columbus 2009); 30-80 cm tall; stems branched from base and lower nodes, joints enlarged, lower sheaths hairy. Flower spikelets 1-flowered, glumes almost equal 2-2.8 cm with short awn, lemma densely hairy at base, 1.1-1.4 cm, 3-awned, awns equal, fused at base in a twisted column 0.7-1.3 cm, free parts 3-5 cm; inflorescence open, lax, 10-30 cm long; blooming and fruiting Aug.-Oct.
Habitat: Dry, sterile, soil in open areas, sandy fill, dunes. Notes: Seeds eaten by a few birds and small mammals; plants eaten by rabbits.